A gruff Ulsterman from South Auckland, William Ferguson Massey, or ‘Farmer Bill’ as he was known to many, is our second-longest-serving prime minister. He was reviled by the left for his actions in breaking the Great Strike of 1913, in which he employed mounted special police whom the unionists dubbed ‘Massey’s Cossacks’. As well as leading the country through the bitter industrial strife of 1912–13, he had to contend with the First World War, the 1918 influenza pandemic and the 1921–22 slump. Massey and his Reform Party campaigned on platforms of patriotism, stability, law and order, and the protection of private property. Massey kept most of the Liberals’ reforms, cleaned up the public service, increased the rate of home-ownership and spent more on education, roads and electricity. His Reform Party also established meat and dairy producer boards. Following his death from cancer on 10 May 1925, Massey was buried at Point Halswell above Wellington Harbour. 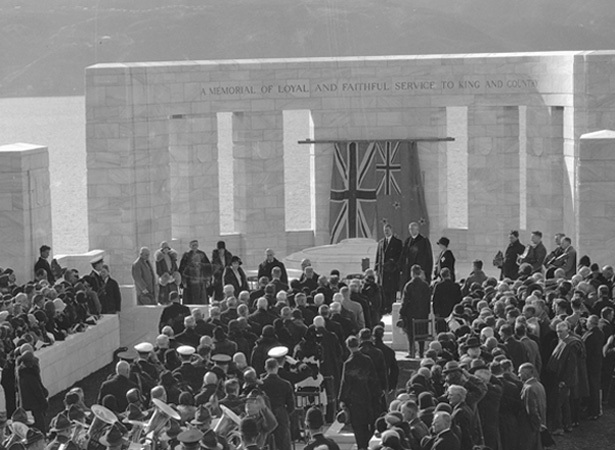 In September 1930 a large memorial was unveiled at the site. His wife Christina was also interred there following her death in 1932. Read a biography of William Massey here. We have 1 biography, related to Death of William Massey .